Top-of-the-line engineered power systems for gas & diesel pickups. Advanced tuning for sport applications + airflow upgrades (including intercooling). Adds tire-smoking constant-duty power—up to +155 hp/+385 lb-ft—plus greater durability. STEP ON IT—AND STAY ON IT! PowerPack® Systems (for work) and Big Hoss® Bundles (for sport or race) calibrate CleanTune® fuel delivery to the improved intake airflow and air density for colossal CLEAN power gains with more MPG and cooler exhaust gas temps (EGTs). The Banks Combination delivers optimum power at any EGT. And because Banks cares about the complete vehicle, we honor your powertrain limits. Others give you power that puts your engine on kill. What’s the point of that? Go with Banks. Then put your foot in it and leave it there! Choose from Stinger®, PowerPack®, Six-Gun® and Big-Hoss® Bundles. Available for many applications, call for more details. The Banks Combination gets it right. This is why Banks car, truck and boat engines have set records and won championships for five decades. Our World’s Fastest Diesel Pickup and World’s Quickest and Fastest Diesel Drag Truck are The Banks Combination — built in our shop and applied to a total vehicle. Only Banks Power designs, tools, tests and manufactures complete vehicle power systems in-house. Whether in a Banks racer or on your truck, everything is designed to work together. 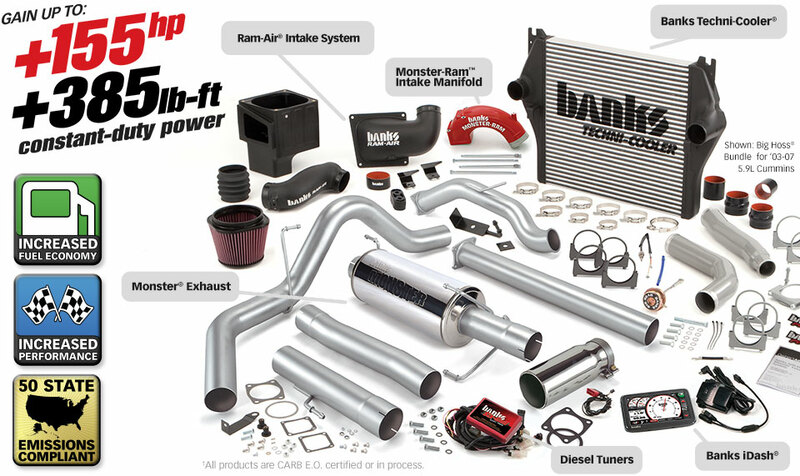 If you will eventually buy an intake, tuner, exhaust and other stuff, take a hard look at one of our systems. We specifically build them in work, sport, and race versions. And you can buy a Banks system all at once or a section at a time.